This morning on my way to class, I passed a lady on the sidewalk with a black smudge on her forehead—and I almost stopped to alert her to it when I saw several other people with smudges on their heads…and realized that it’s Ash Wednesday, the beginning of Lent. I did have a Mardi Gras party last night, after all, so you’d think I’d have made the connection sooner. But I grew up Protestant, in an almost homogenously Protestant community, so…I forgot. What can you do? Lent, or the Lenten season, is the forty-day period before Easter devoted to repentance, abstinence, denial, and soul-searching, and has been observed by some sect of Catholicism since at least 1500 AD. Many practitioners “give up” something during lent—candy, drinking, smoking; others vow to do things during Lent—exercise, practice frugality (note: Sundays are not counted in the forty, because Sundays commemorate the Resurrection. So usually it ends up being 47 days…which you should keep in mind if you’re giving up, say, chocolate). Mardi Gras, or Fat Tuesday, is the night preceding the advent of Lent and is traditionally a last fling before the impending solemnity. In mid-February, the ancient Romans observed the Lupercalia, a pagan festival that functioned as a purification and fertility rite. Many other offshoot pagan rituals evolved out of Lupercalia; all came at the end of winter and just before the first planting/spring solstice, and all celebrated fertility and good fortune for the coming year, as well as an abundant yield of crops. When Christianity was embraced by Rome, the Catholic Church attempted to make its receipt more palatable by merging some pagan rituals into Catholic ones (Easter also falls on the day of what was originally a pagan celebration of fertility and fruitfulness). Thus, In 494 AD, the Pope made the Purification of Mary an official holiday: If Christ was born on December 25, then He must have been conceived by the Holy Spirit in mid-March. Today, Mardi Gras is celebrated by the Church as a symbol of human overindulgence, to be reflected upon and repented for during the span of Lent. Historically, it was customary for practitioners to fast during Lent in honor of its solemnity; many others abstained from eating meat. 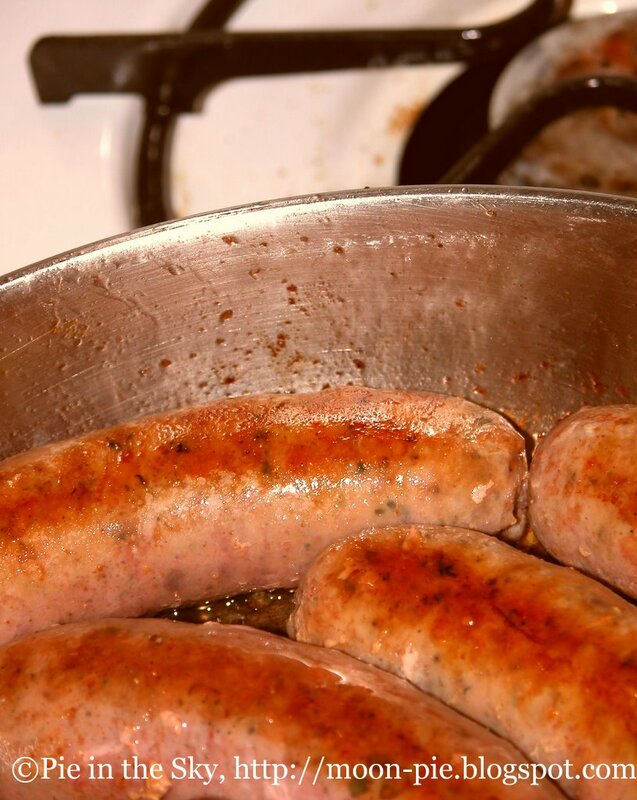 Carnivale, the Italian incarnation of Mardi Gras, literally means “leaving meat behind.” Therefore, it is customary not only to indulge in decadent sweets and drink on Mardi Gras, but also in meat. 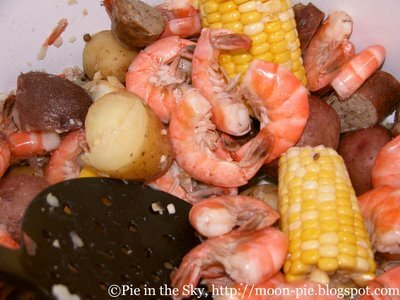 Which brings me to the subject of this post: Low Country Boil. Practiced by the French, Mardi Gras was brought to the New World via New Orleans, where it is, of course, still richly celebrated to this day. Famous for its melting-pot culture of French, Spanish, South American, Sierra Leonean, Senegalese, Gambian, Guinean, Liberian and Barbadian, New Orleans is home to mouth-wateringly unique Creole cuisine. Low Country Boil (which has a variety of aliases—crab/shrimp boil, St. Helena Stew, Frogmore Stew) perfectly embodies this blending of culinary traditions: Like various African cuisines, it’s a one-pot meal; it’s reminiscent of French stews; it’s rich with Spanish garlic, Caribbean allspice, African cayenne, and many other exotic herbs; it’s full of Louisianan shrimp (and crawfish, if you’re lucky enough to get your hands on some). Low Country Boil is often made on or before Mardi Gras, and is traditionally served poured out on newspaper on a table. It’s a wonderful mess and a festive social gathering unto itself. Here’s my very own Low Country Boil recipe—a tremendous success last night! About 12 people partook, and I barely had leftovers (and I started with almost 15 pounds of food). Due to collegiate financial restrictions (as it was, I charged everybody $5 to cover some of the groceries and the stock pot I had to purchase), my boil is shrimp-only, but it’s great with crawfish and/or blue crabs. 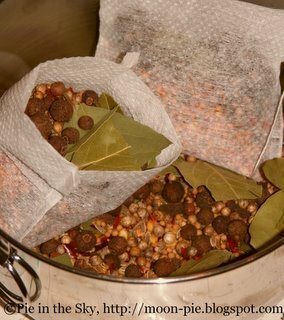 Mix seasoning ingredients together; place in a square of muslin or cheesecloth and tie securely with string. Feeling lazy? In some supermarkets, low country boil seasoning is available pre-made. 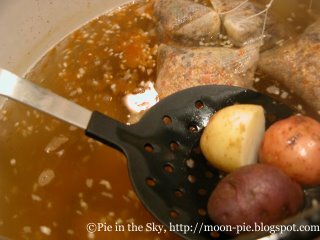 Boil water in a stock pot on stove or outdoor cooker. Heavily salt water; add juice of ½ lemon. When water has come to a boil, add sachet, garlic and potatoes and cook for 10-12 minutes. Add sausage, corn, return to a boil and cook for 2 additional minutes; check to make sure potatoes are tender, then add shrimp. Cook for 2-3 minutes or until shrimp turn pink. 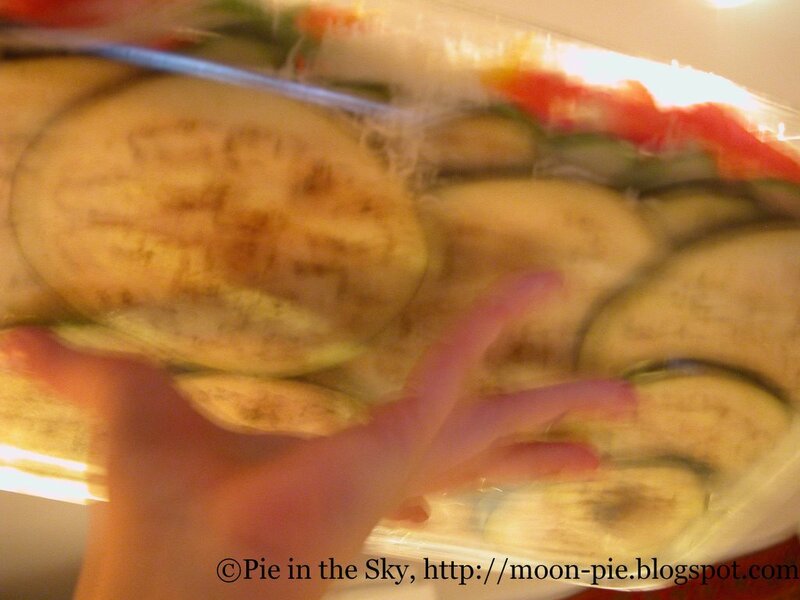 Drain into a large colander; return to pot or simply pour onto papered table. Have cocktail sauce available. The boil went over smashingly, and was accompanied by Greek Veggies (Courtesy of Mom)—also very well received—and followed by pound cake and King Cake, a New Orleans tradition supplied by Andrew. Thanks! Dot with butter and bake at 350 degrees for about 45 minutes or until tender. *my variation. Mom uses only green peppers. Did you really make your own seasoning bags? Such dedication to excellence! You must call me and tell me all about the party. I love getting new additions to your blog. They are always informative and fun to read. I'm impressed that with the great meal you provided though on a student's budget. The king Cake does look great. Also, thank you for stopping by my site. I have always wanted to make a King Cake and this was my year. It's my tribute to New Orleans. Come back and visit Soul Fusion Kitchen. Your big sis shared your site with me this week! Wow! I am so impressed. I will be coming back for more! What great recipes! And as someone who has been blessed to experienced the culinary talents of your mom, your sister Kim, and even your brother Mike's spicy chili, I'm certain your collegiate friends love attending your parties! Hooray! Michelle! Thanks for visiting =) I'm having a lot of fun with it. Let me know if you try anything or have any ideas! Much love. All of that looks sooo good. I just found a recipe for the Low Country Boil in a new magazine I found today. I had never heard of it. I'm posting the story tomorrow. Your recipe looks better. I'll let you know when I try it! Thanks for sharing!